We came up with a different way of hooking up a turbo oil drain. We use TWO special 45 degree swivel fittings at each end of the hose, a short length of -10 braided steel hose.. Included is a turbo flange and bolts. Please note! The old drain can be a real pain to install! No matter if you are installing a stock one OR aftermarket version, this is a real tight area to work in! The more items you can remove for access, the less cursing and bruised knuckles will result. On my own GN, I removed the t-stat housing, the coolant sensor, the "S" hose, MAF pipe and up pipe. The hardest part is getting to the huge brass adapter on the block for the stock drain. 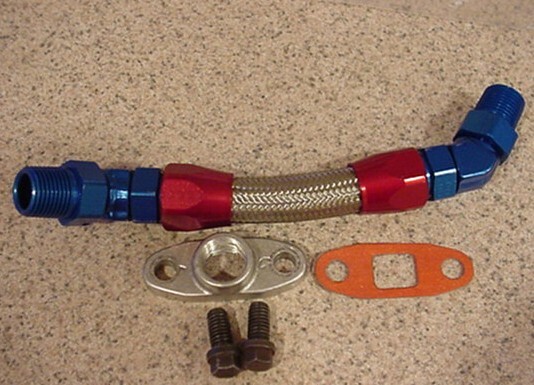 Once that is removed it is a matter of installing the swivel fitting into the block and then connecting the assembled turbo flange to the turbo. Unlike other drain kits on the market, this one will not kink. Cost is on the high side due to the TWO special 45 degree swivel fitting. Kit is sold assembled.